Oh my goodness, this week has been crazy and I am not even going to Quilt Market! Two of my quilts did get to make the trip and are hanging in the Island Batik booth though and since I have actual pictures of them there I am very excited to share them with you! (I have been trying not to write with all exclamation points, but I will probably be using way too many in this post...I am excited after all.) This is the first one - I am so delighted to see it featured in the display! Photo is thanks to my fellow Island Batik Ambassador. 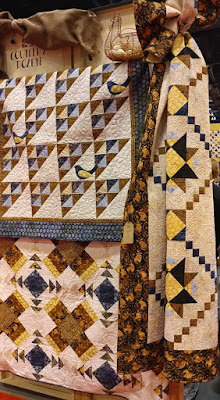 Laura (Slice of Pi Quilts) who is at Quilt Market and posted them for us to see. Alouette is the quilt with the little birds at the top of the picture! I love, love, love this quilt and was so excited to share it. I designed it from a photo prompt in the Quilt Design a Day facebook group and have wanted to sew it up ever since. When I saw Island Batik's Country Dozen line I knew it was the perfect fit - the colors and prints were meant for this little quilt, and I'm glad they accepted my proposal and picked up my pattern. And I'm really glad I took a little extra time for some fancy feather quilting on it - but I hope no one looks too close at the quilting - eep! I'm getting better at them, but they are not perfect by any means! Aren't the eggs fun? The fabric in the dark blue triangles has roosters in it. So fun! Before adding feathers. The bird came out really cute! It took a lot of fussing with the shape before I was 100% happy, but I just love it! Here is my original QDAD design. I haven't been active there for a while, but want to get back to it. It's a great way to play with ideas without being committed to actually making them up into quilts! I'll show my other quilt tomorrow so it gets it's own post. So much fun! The birds "make" that quilt! Without them, the design is nice, but with them, it is fun and interesting. The colors are perfect for the design.